Inking Idaho: Retiring Stampin' Up! Products - Something for Everyone! Retiring Stampin' Up! Products - Something for Everyone! It's that time of year again where we say goodbye to some old favorites to make room for the new! The retiring stamp sets will be available until June 3rd, the retiring accessories will be available until June 3rd also, but are while supplies last - do don't delay! Accessories are available until June 3rd or while supplies last. Shoe HERE - some products up to 60% off! 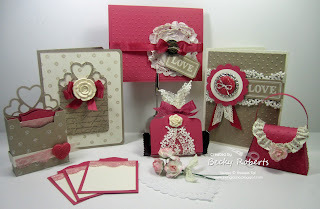 With a $35 online purchase from me, you will receive the Artisan Embellishments Kit tutorial absolutely FREE! For the month of April, this tutorial is FREE to you with any $35 or more order to my online store. The Final Gift & The Gift Packaging! More $ = More Products, Oh Ya! !